George Frazier’s famous dictum remains inescapably true, which is why we’ve been sending our clients to Steven Taffel’s sleek West Village shoe boutique Leffot since it opened in 2008. There is no more tastefully curated selection of footwear in this city to complement the clothes we make at the Custom Shop, and no more helpful guide than Steven, who, like us, prides himself on imparting a certain level of taste and knowledge to his customers. To help celebrate Leffot’s 10th year in business, we asked both Steven and Alan for their thoughts on well-heeled footwear. Conventional sartorial wisdom holds that there should be a correlation between the relative formality of one’s clothing and one’s shoes. Does this still hold in our era of high/low stylistic dissonance? Steven Taffel: It depends on the situation. In a professional business setting one should wear the appropriate business shoe to match his attire. As more businesses are becoming less formal, however, it’s become more acceptable to break this rule. Alan Flusser: The casualization of fashion today has encouraged the stretching of clothing archetypes, welcoming the pairing of what used to be considered incompatible dressing genres: sneakers with sport jackets, heavy sole lace-ups with jeans, or espadrilles with summer suits. Give an example of what you would consider a poor shoe/clothes pairing to be. ST: One of my pet peeves is seeing men in a dark grey or navy suit wearing shoes in a light tan color. It draws too much attention away from the clothing and looks unsophisticated. AF: Harmonizing the scale of the shoe with the weight of what’s worn above it is an important style criteria. Pairing a slipper-like, Italian-style slip-on with a heavier tweed suit or jacket, for example, would be something to reconsider. Is consistency a virtue in footwear? What are your thoughts on having a “trademark” shoe? ST: Personally, I’m for the trademark shoe. I wear the Edward Green Dover (an iconic hand-sewn split toe) all the time. I probably have 10-12 versions. Same goes for Alden’s classic longwing gunboats. If you find a style that’s comfortable and works well with your wardrobe and lifestyle, I see no reason not to embrace it. AF: If by consistency you mean sporting only that footwear which is iconic in design, such as a Weston penny loafer or a Belgian loafer, yes please. Adopting only one style of shoe for all occasions under the guise of a personal trademark, however, risks coming across as as bit pretentious, and would at least require tremendous personal style to pull off. How important a virtue is subtlety in a shoe? Should fine shoes ever attract attention to themselves? ST: There is subtlety and there’s boring. There’s attracting attention and there’s over the top. I like a nicely designed quality shoe that has style without screaming “Look at me!” A fine pair of spectators, or an unusual color, or having suede in the right places — they all show you have confidence in your personal style. AF: I stand by the truism that the more effort and knowledge one puts into their shoes and attire, the more subtle the result should be. Understatement can be a powerful style statement that bespeaks confidence and sophistication. Fine shoes should an extension of your personal style without distracting from the overall picture. Do you choose your shoes to go with your clothes, or vice versa? ST: I usually choose my shoes to go with my clothes. Depending on what I decide to wear I either go with a dressier or more casual shoe. Even if I’m wearing dark denim and an odd jacket I can dress up the look with an oxford shoe or dress it down with a pair of boots. It’s the details and the way you accessorize your clothing that sets the tone of how you look. AF: It can work both ways. Some days I’ll wake up and decide to wear a particular pair of shoes and then have to devise an outfit to go with it. Other days, a random jacket or sweater happens to focus my attentions and my footwear has to fall in step. Which is generally more formal for you — your shoes or your clothing? ST: These days, like a lot of our customers, my clothes are less formal than my shoes. As I said before, you can dress up a sporty outfit with a formal shoe for a smart casual look. AF: Hopefully, neither, but it’s better to err on the side of more formal footwear. Context matters as well; wearing a monogrammed velvet slipper with a suit during the day would be regarded as sophomoric and inappropriate, while donning the same items for an evening dinner party would register much higher on the sartorial standing scale. What are your thoughts about pairing socks with shoes and clothing? Do you tend to match one or the other, or go for contrast? ST: If I’m looking for a match at all, I tend to match with the clothes. But I do like a nice contrast now and then. AF: Ideally, hosiery should either match the color of the trousers or some color or pattern worn above the waist. If socks match the shoe, they cut off the trouser at the sock line, separating the foot from the trouser and diminishing the perception of the wearer’s height. The most accomplished dressers like to have their hosiery echo in color or pattern some item of clothing found above the beltline, such as the necktie, shirt, or even the jacket’s breast pocket hank. In this way the observing eye is forced to run the full length of the silhouette, elongating the overall impression. What are your thoughts on going sockless? ST: I’m not a fan of sockless, mostly because I don’t personally find it comfortable. I’m not opposed to it as a style, but some guys take it a little to far in my opinion. AF: I personally never wear socks unless the weather or ensemble demands it. I have worn suits without hosiery and even a summer dinner jacket sans socks. I grew up around people who didn’t wear socks in the summer and it continues to appeal to my sense of high-brow insouciance. What are your ideal rain shoes and why? Snow shoes? ST: This is the question we get asked most often. We all struggle to find that balance between style and function. The past few years we have designed classic dress shoes and boots in textured and grained leathers that are more resistant to foul weather. Some have thin rubber sole, and others have heavy lugged soles. This combination is practical, stylish and can also be worn dressed down. AF: My rain shoes vary from slip-on olive-green rubber stable muck-ups to water-resistant brown suede loafers with a outdoor rubber sole that I had custom-made in Vienna. As for snow shoes, the choice depends on the amount of snow, from a European apres-ski boot to an Italian lower-set hunting and shooting boot designed to be worn for outdoor sport. To help illustrate some of Steven and Alan’s points, we’ve assembled a few examples of how Leffot’s shoes and our custom clothes can come together to be more than the sum of their parts. A dressy yet versatile bench-made slip-on that elegantly reconciles the style vs. comfort conundrum, the light construction of the St. Crispin's 539 pairs perfectly with our featherweight wool-and-silk seersucker. It’s the closest you can get to wearing slippers and pajamas while still being dressed for a board meeting. The classic Edward Green Dover steps effortlessly ahead of the style parade and shows no signs of dating. Whether made up in rich suede or burnished calf, it complements richly textured cloth like our Italian exploded birdseye flannel. A perennial recommendation for the worsted suit and tie set, the burnished brown calf of the John Lobb Phillip 11 offers a mahogany richness that sets off all fabrics and colors. Ideal as the traditional yet sleek foundation for bold modern suitings like our crisp Dior-green summer mohair. The simple, elegant design of the St. Crispin’s 647 make them wearable with anything from custom khakis to worsted business suits, but especially in snuff suede, they’re ideally paired with an textured autumnal cloth like our Flusser Exclusive country plaid. We developed our knitted slack jacket to be the most comfortable tailored garment a man could own. 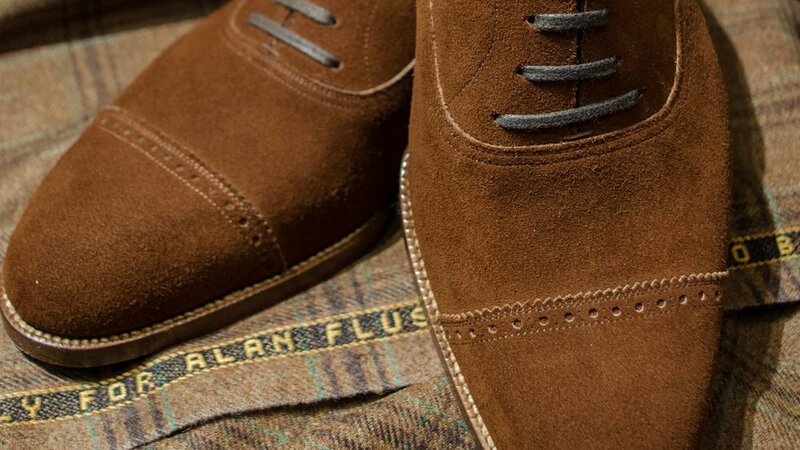 Its relaxed elegance is perfectly complemented by a pair of unpretentiously slouchy Alden suede chukkas.